UNITED NATIONS, Oct 10 2013 (IPS) - Just 17 years from now, nearly half the global population could be facing water scarcity, with demand outstripping supply by 40 percent. As 2013 draws to a close, the world body itself is getting mixed reviews on the progress made in a more than decade-long effort to resolve the world’s water and sanitation problems. The numbers remain staggering: more than 768 million people are without safe drinking water and over 2.5 billion without adequate sanitation worldwide. But neither of the demands is expected to be met fully when the U.N.’s Millennium Development Goals (MDGs) – primarily to reduce and eradicate extreme poverty and hunger – reach their 2015 deadline. Barbara Frost, chief executive of WaterAid, told IPS the MDG target for drinking water – reducing by half the number of people lacking one of the world’s finite resources – has been met globally. “And the U.N. and its agencies should be rightly praised for their major contribution to this achievement,” she said. Still, many African nations, and the African region as a whole, are off-track in meeting this commitment to their people, she added. 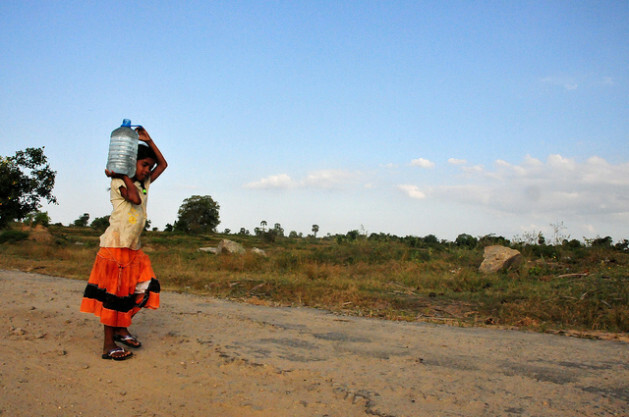 The petition was created by a coalition of non-governmental organisations (NGOs), including WaterAid, and led by End Water Poverty. The signatures came mostly from South Asia (670,000) and Africa (180,000) – two regions that have some of the lowest levels of access to sanitation and water. “Every signature collected offered an opportunity to inform and educate people to their rights as well as highlight the commitments that have been made by governments to improve access,” Frost said. According to the U.N. chief, water holds the key to sustainable development. “We need it for health, food security and economic progress. Yet, each year brings new pressures,” Ban said Tuesday. Ban said water is wasted and poorly used by all sectors in all countries. That means all sectors in all countries must cooperate for sustainable solutions. “We must use what we have more equitably and wisely. We cannot expect governments to do this alone,” he added. Danielle Nierenberg, co-founder of Food Tank, told IPS while the world has been able to meet the MDG of halving the proportion of people without access to safe drinking water, there are still some the 768 million people who don’t have clean water. “That’s roughly twice the population of the United States,” she pointed out. Nierenberg said much more needs to be done to ensure that clean water gets to the people who need it the most – in places like Haiti, Bangladesh, Niger, and other countries, where not only clean water is scarce, but also adequate nutrition is non-existent. Research organisations, governments, and the funding and donor communities need to put more investment in making sure agriculture – which makes up 70 percent of water use – conserves water, she said. “Until the world invests in innovations – agroforestry, cover cropping, more efficient irrigation, and other practices – we won’t be able to make sure everyone has access to clean water,” she said. The solutions are out there, they just need more attention, more research, and ultimately more funding and investment, she stressed. In July 2010, the General Assembly adopted a resolution declaring water and sanitation a basic human right. Asked what progress has been made since then, Frost of WaterAid told IPS the latest figures show that between 2010 and 2011 nearly 100 million people gained access to water while over 70 million gained access to sanitation. “While much of this progress has been taken up through similar increases in population, we should acknowledge that these services are being provided in large numbers to those who don’t have,” she said. Recognition by the General Assembly has also been important for those who do not have formal rights to the homes and land that they live on – like the over 800 million living in slum areas, Frost noted. The right to water and sanitation has given these communities a counterweight with which they can argue more forcefully that they should still have their right to water and sanitation realised through the provision of these services, she added. Frost said in order to ensure that everyone, everywhere has access to safe water and sanitation, the U.N.’s post-2015 development agenda must include a specific goal and the enabling targets for universal access to these basic but essential services by 2030. Without everyone, everywhere having the essential access to water and sanitation, the dream of eradicating poverty in our lifetimes, will remain just that, a dream, she said.